and to the hospice thanks to donations received. Each time she returns to Yangon Pamela visits local markets and buys basic necessities such as rice, lentils, oil, vegetables, copybooks and pens, delivering them directly to the headmistress of the school together with donations to help the daily running of the institute. She does the same for the hospice helping the sisters to purchase food for the 220 old people in their care. We have also given donations to Kyaw Kyaw Win, a blind teacher in a small school in Sittwe in the Rakhine state in the north of Myanmar and we actively support Samnang Chhon’’s Angkor Kid’s Centre in the village of Samrong near Angkor Wat in Cambodia. The Mary Chapman School for the Deaf, in Dagon Township in Yangon, was founded by an English lady in 1920. It is a private institute and does not benefit from any state aid, depending entirely on donations and humanitarian aid. As well as teaching deaf and dumb children, aged from 5 to eighteen, it is a vocational training centre for teachers for the deaf. 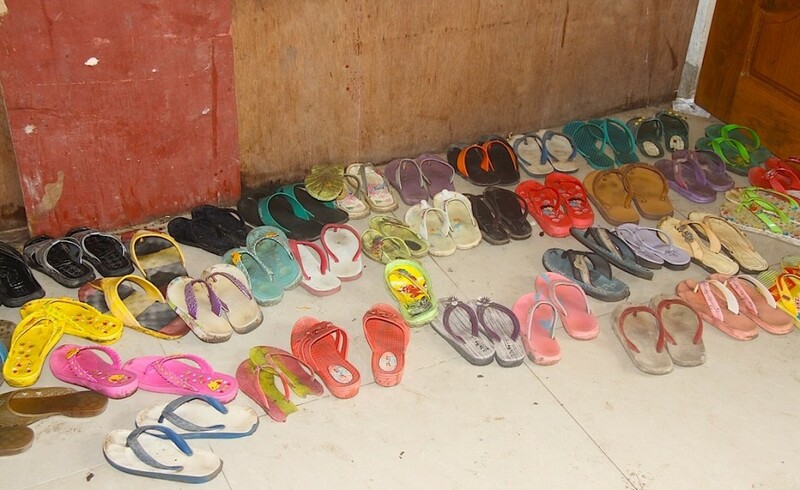 Currently the school has some 350 pupils from 12 different ethnic groups and of 4 religions (Buddhist, Christian, Muslim and Hindu) some thirty of whom are full-time boarders either because they are orphans or their families live in other parts of the country. There are also ten young trainee teachers who help the children learn crafts such as sewing, dressmaking, knitting, embroidery, how to use the PC, book-binding, cooking and Shiatsu massage. The Angkor Kid’s Centre in Samrong VIllage, near Angkor Wat in Cambodia was set up by Samnang Chhon and now provides after-school English classes for close to 400 children. In 2013 Link for Aid send many children in the village to school by providing uniforms and bicycles to children whose parents could not afford to buy them. We also gave scholarships to some of the volunteer teachers, allowing them to continue with their education at universities and training colleges. And we made available a microloan for Sremoya, a young girl in the village, allowing her to set up her own small business selling sugarcane juice.